I'm excited to introduce Sarah from Fantastical Sharing of Recipes as we finish off the first week of guest posts here at Morsels of Life. (Don't worry - I've got more tasty eats planned for next week and tomorrow's Five Friday Finds, so be sure to stop by again!) Sarah's got a lot of fantastical recipes over on her blog, and I know I look forward to Tasty Thursdays every week. 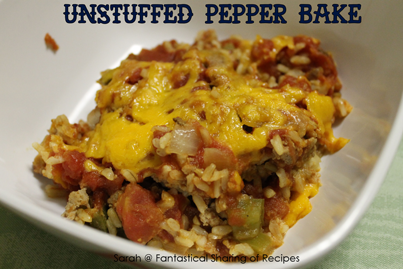 Let's all give Sarah a warm welcome as she shares her Unstuffed Pepper Bake! Hi all! I’m Sarah from Fantastical Sharing of Recipes. I have been blogging as many recipes as I can test out in my kitchen for the last 2 1/2 years or so. My family thrives on variety, and I try to stay away from prepared foods and boxed meals. All the deliciousness of a stuffed pepper without all the hassle - with turkey, instead of beef, for a healthier alternative. This recipe is very similar to one I’ve made and blogged previously, except that this one you bake instead of cook in a skillet. I have one good deep skillet and I seem to always need it, so I like to use my other skillet to cook meat/veggies and then bake the rest of the meal. It’s just easier sometimes. I’m sure this could also be prepared ahead of time and stuck in the oven at your convenience for a quick meal. 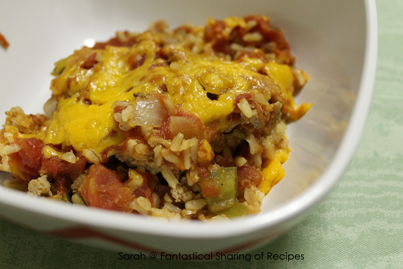 It’s tasty, and with turkey, brown rice, and veggies – it oughta be easy on your waistline! Saute turkey with onion and green bell pepper for about 5 minutes, until turkey is browned and veggies are softened. Add garlic during last minute. Season with salt and pepper. Add diced tomatoes and rice and remove from heat. Stir in 1 cup cheese. Pour into a greased 9x13x2-inch baking dish. Pour tomato sauce over top and sprinkle with remaining 1 cup cheese. Salt and pepper to taste for serving.